The Houston Public Library is in a forgiving mood. Patrons that have a balance on their accounts due to a lost or misplaced item such as a book or DVD can have their fines erased from the system under an amnesty program the library is currently offering. The program is only available to those that sign up for the “My Link” library card by Sept. 26 and have less than $25 in fines. Houston Public Library is providing this incentive so it can reach its goal of 1 million registered users by the end of 2015. It currently has about 773,000 cardholders. My Link library cards are the first new cards generated by the library system in over 14 years. Although there isn’t an added bonus over the current library cards, library officials say current cards will soon become inactive. The My Link cards will help deliver advanced data regarding the user experience at the library. Houston Mayor, Annise Parker said the new program gives library patrons a clean slate. Stating if users were worried about going to the library because they owed money, that worry should be instantly wiped away. She added the new cards will help the library gain a better understanding of the services used and how to best allocate those resources going forward. Houston Public Library Communications Manager, Greg Simpson said nearly 171,000 people are qualified for the one-time amnesty program. He said that accounts for roughly $1.8 million in fines. The library system expects a total of $100,000 worth of fines to be waived through this initiative. The public library estimates it collects roughly $550,000 in fines each year. The amnesty program has piqued the interest of a few patrons that have left the library system to avoid the rising fees. It has also made the day of others that weren’t aware of the program and were told that their fees were no longer due. 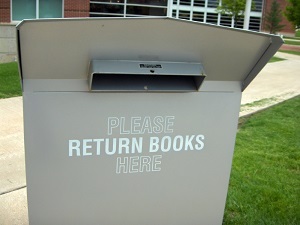 Simpson said many library members forget to return a book or DVD altogether or simply don’t have the time to return an item. He said communications are sent to each person that has an overdue book by e-mail, text, and telephone call. Even with all of those options, people still end up accumulating significant fees. Jerry Davis a District Councilman is all for the amnesty agreement. A father, whose children have racked up a few fees of their own, is happy to wipe the slate clean with My Link. He laughed, stating he will finally be able to take his children back to the library. He added that he still finds library books while house cleaning. Library Director Rhea Lawson said while the amnesty program helps individuals get out of a small debt, garners good will, and a new card can create excitement. This process is part of an overall transformation in recent years, Lawson said with the library expanding its electronic resources, it has evolved into a community center that can link users to anywhere in the world. What was once a place to sit and read books has opened up to become a link to the entire world.